There is a new coffee spot on campus for thirsty students, late night study groups, or students who just need a coffee break: the Rocky Roasters coffee kiosk. The original project started last year when Rocktivities, which organizes student on-campus activities, experimented with the idea of having a coffee shop on campus. The Rocktivities staff liked the idea of a place that was open in the evenings and available to the students so they could get their coffee fix without having to leave campus. They opened the Grill a few nights a week and found that students really liked the accessibility and convenience that came from the location, and that the students also liked the variety of drink options. From the success of those test nights, it was decided that the campus should try having a coffee kiosk on a regular basis. For college students, it can be really hard to find enough money to go buy a coffee that ranges in price anywhere from two dollars to six dollars. 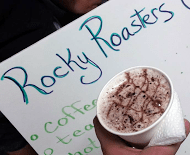 The Rocky Roasters have a solution to lessen the price of their coffee and treats. “We only charge enough to cover our supply costs,” said Austin Dreyer, a freshman barista. By only charging to cover the cost of supplies, they are able to sell drinks and treats that are typically priced a dollar or less, making it very college budget friendly. Their menu samples what they can make, which includes coffee, a selection of teas, hot chocolate, lattes, mocha, cappuccino, espresso, Thai coffee, chia, and various flavors of muffins. When asked what the best-selling item is, Dreyer said, “The mochas and the frappes are the best sellers,” while his favorite item on the menu is the “Thai coffee, because it is a different and interesting drink.” The Drink of the Month, starting in November, will be a Pumpkin Latte. As of October 8, the Rocky Roasters are working off a table that they set up the nights that the kiosk is open, but their hope is to soon have a stationary kiosk that will be used not only for Rocky Roasters events but eventually by other campus departments for their events. They are hoping that they can also get enough interest in the kiosk to open up the Grill seating area to provide a study and hangout area for their patrons while they enjoy their coffee. The Rocky Roaster baristas also welcome any suggestions or requests for drinks that they should add to their menu. If you have a suggestion, stop by their request box and make a request. Requests for new drinks will be collected and then randomly drawn to choose the new drink.